Enjoying your Berry Breeze today. Nice one! Thank you for the share. I made a 100ml of my Strawberry Frosted Sugar Cookies recipe but within days it is down to maybe the last 15-20ml… Itd be better steeped but i couldnt keep away long enough it was delicious. Sounds good that, my better half has me on a mission for a good strawberry mix. Every one I’ve mixed to date was lacking in the strawberry, it just seems to get swallowed up. Is the sweet holding up in this? I don’t have cheese icing, would NY cheesecake be a good sub? Sounds more like Meringue would be more suited as a sub maybe? I have no clue if it’s faster since I steep most juices at 1 month. Sorry ! I bet that would be good with some passion fruit as well! Thanks for the idea! I find that pyure doesn’t affect my steeping. It mixes up really well and doesn’t need any extra time added. 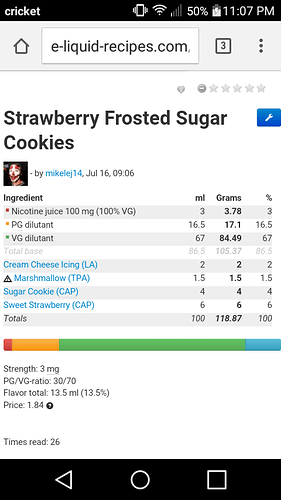 It’s a shake’n’vape recipe thread, created by you!